Born in Geneva on 19th November 1839, Brossa became a pupil of Vincent Louis Dorus at the Paris Conservatoire around 1860. Whilst in Paris he often performed with chamber groups playing, most notably, in quartets along with the celebrated French flautists, Donjon, Walckiers and Taffanel. He moved to England in 1870 to take up his appointment as principal in Hallé’s orchestra, remaining there for the next 29 years. 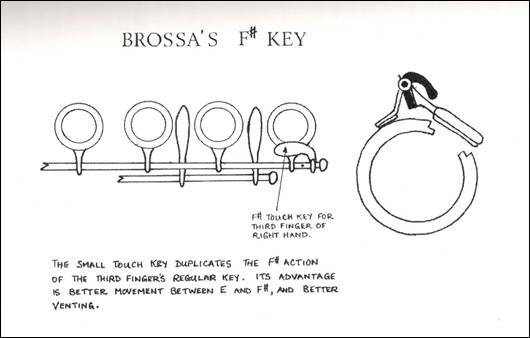 In the late 1880’s Brossa worked on and perfected an addition to the Boehm key system. He devised an extra F# key for use by the third finger of the right hand which is still in use on some flutes today. 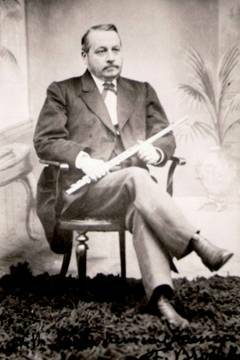 The year 1895 seems to be the earliest recorded sale of a flute with his F# key fitted, the work being carried out by Schumacher at Rudall Carte’s workshop.